Every face has a story to tell… what’s yours? 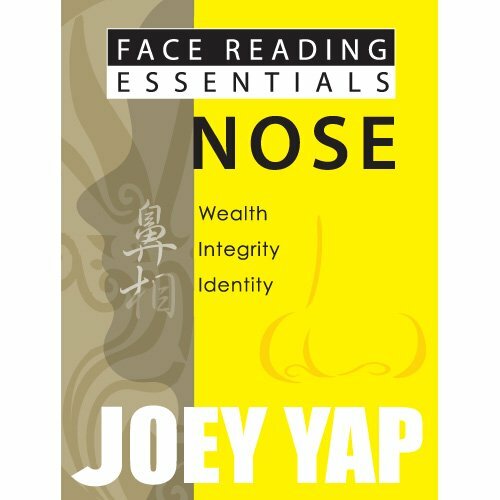 Joey Yap’s Face Reading Essentials comprise a series of short yet detailed guides that describe each important facial trait on the face. These are accompanied by clear, elegant illustrations that you can easily identify and reference into types on a REAL face. You’ll be able to use the information given to ‘practice’ on any face, whether it’s your own, or those of your friends, family, and colleagues. In this book on the Nose, be informed and be entertained with this guide to knowing what this seemingly minor facial feature has to reveal about you, and those around you! Find yourself, your friends, and your family among the 50 types of eyebrows shown here, and be on your way towards understanding why it is the key feature that reveals your wealth prospects and capabilities. Is your nose broad or narrow – and what does that have to say about the amount of money you’re likely to have in your life? If your nose is crooked, are you more apt to take the morally-ambiguous path? If you have a scar on your nose, how will you fare in long-term relationships? Flip open the pages of this book to know what type of nose you have, and what it means. It’s as simple as that! An ancient practice is now condensed into easy-to-digest nuggets of information. If you’ve ever wanted to know more about people in general, and why we have such vastly different personalities, perceptions, and reactions, Face Reading is the first captivating step in a journey that will reveal plenty of insight. Simple, intriguing, and most of all, FUN, you’ll never look at any face – and at any mouth – the same way again!